to life….we do the delivery and set up so you are worry free. How did we choose balloons? It was born out of a lazy summer day in and a cool yard sale find. Our first piece of “equipment” a Faballoon. We had no idea this cool toy would spark a family business. After lots of fun stuffing teddy bears in balloons we decided we wanted to learn more. With the help of another local balloon artist and hours of watching instruction videos Get Ballooned was born in 2005. With a passion for creativity and learning, we expanded into Event and Corporate decor. But never leaving behind our love of delivering occasion bouquets to brighten someone’s day. 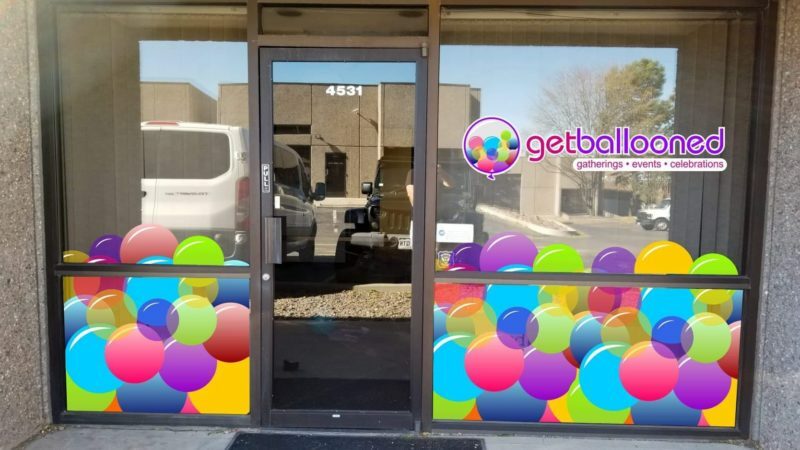 In 2018 Get Ballooned moved from its humble home based beginnings to its current location 4531 S Decatur in Englewood Colorado. You are!! Anyone with a birthday :). We are happy delivering a single bouquet to lift someone up on a special day and equally excited to set a grand hall for a corporate event. How would I describe our shop? Music plays a big part in our day often helping us get in the groove. Our Favorite song “Happy”. Everyone at Get Ballooned truly enjoys bringing balloons to life. We have a very creative team that enjoys taking on new challenges. We take pride in making sure every arrangement meets the expectation of you our customer.